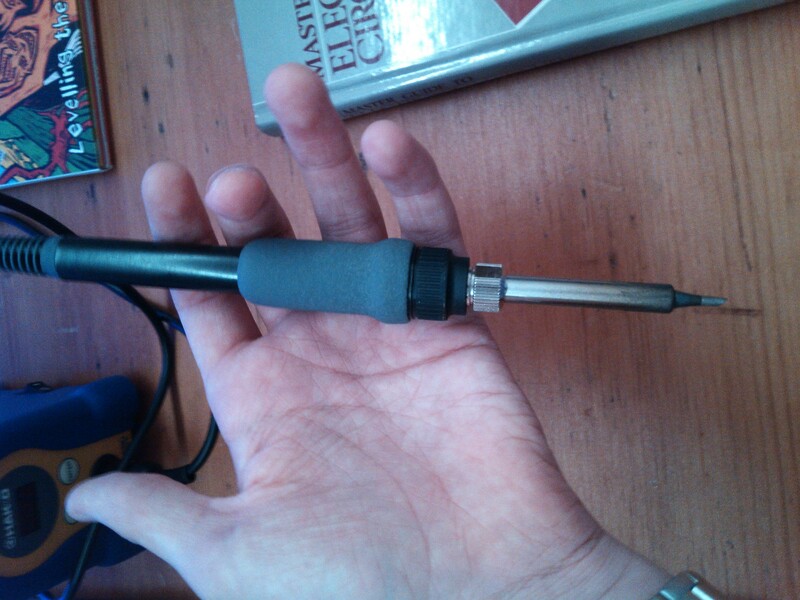 So I’ve been soldering on my old Soldering Iron (Antex C15), which, don’t get me wrong, is a lovely iron for it’s price, for a while. But I’ve been doing a lot of soldering recently and it wasn’t quite good enough. So I decided to upgrade to a slightly higher priced and more professional Soldering Station, the Hakko Fx-888D. I’ll start with some of the issues I had with the Antex, so we can compare them. First, the Antex had no temperature control, and although many people who have used a non-temperature controlled iron for a long time will say this doesn’t strictly matter, it makes a lot of difference to me. 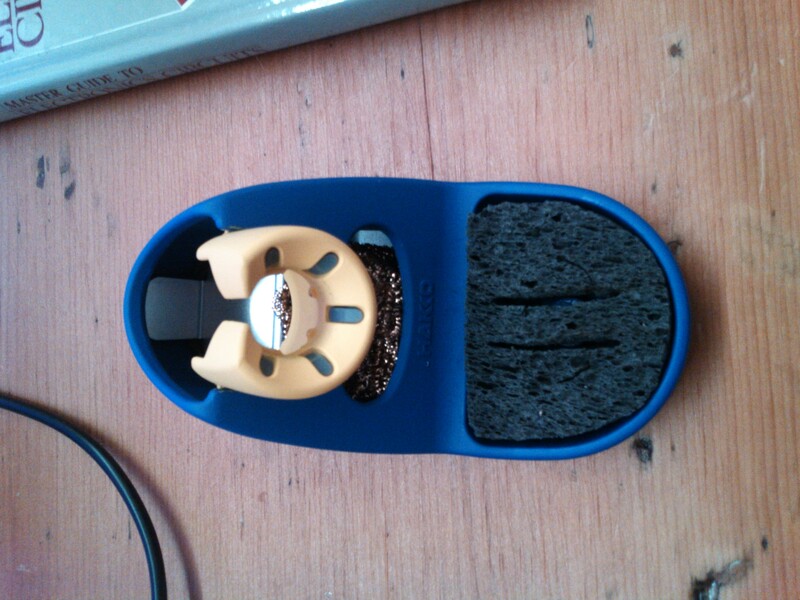 Secondly, the Antex is not isolated from the mains, and if you are not careful this can REALLY mess you up. Thirdly, it took a long time to heat up (about 4-5 minutes in my case) and if you just want to do something quickly, then this isn’t fun. Finally, it has a hefty cable connecting it to a mains plug which doesn’t flex very much, making it awkward to manoeuvre sometimes. So how does the Hakko compare? Well, first off it does have temperature control. This can be useful in many cases, if you are often switching between leaded and unleaded solder this is a blessing, because they both should be used at different temperatures. And if you a switching a lot between soldering small components with a small thermal mass, and big beefy cables with a very high thermal mass this again can help a lot. There is nothing worse than trying to solder to a large thermal mass object with just a small 15W iron. 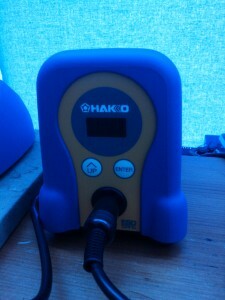 Secondly, the Hakko Iron is not only isolated from the mains, but it is also ESD (Electrostatic Discharge) safe. ESD is a problem that can occur when humans, who build up a lot of static electricity, touch components, and the static is discharged through the component, sometimes breaking it. 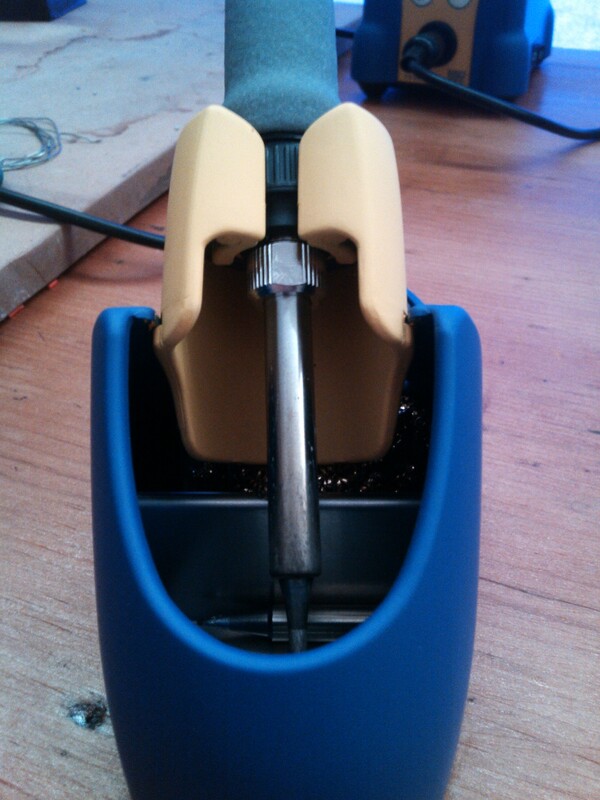 To avoid this the rubberised handle for the Iron is made of a special conductive rubber which itself is connected to ground, ensuring when you pick it up all the static electricity is discharged to ground making you ESD safe. Thirdly, and for me this has made the most difference, this iron is very quick at heating up (for me it takes about 45 seconds). This means if you want to quickly make a small alteration to a prototype it isn’t a hassle to wait for the iron to heat up and you can be done in 2 minutes. Finally, the design of this iron is in my opinion superb! 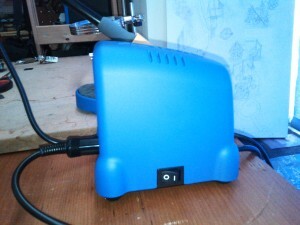 The unit itself doesn’t take up much space on the bench, and the UI is (mostly) simple and easy to use. 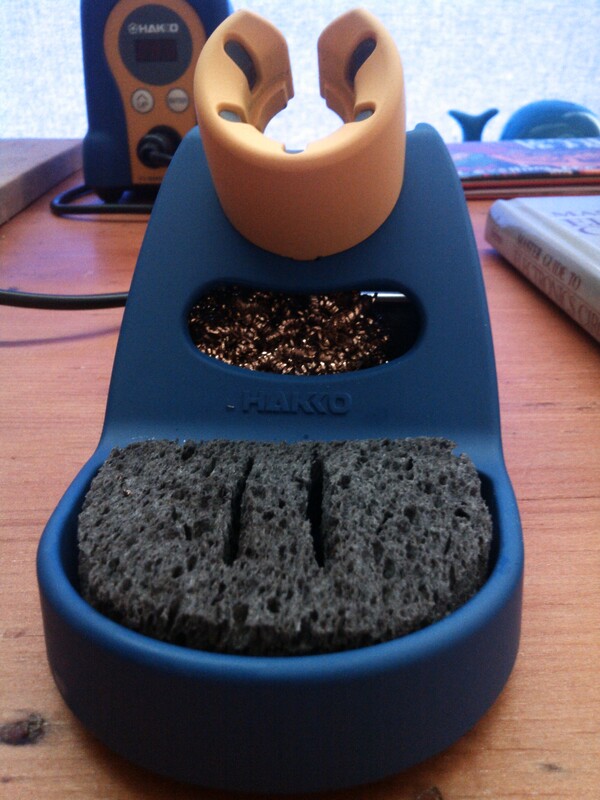 The iron itself is comfortable to hold and easy to manoeuvre (the cable is nice and flexible and light) and the custom holder that comes with the iron is very convenient, having a place for a sponge and some brass wool to clean the iron tip (both supplied with the iron). To say this iron is without flaws though would be a lie, for one, the manual supplied with the iron gives very poor instructions on how to change the modes. 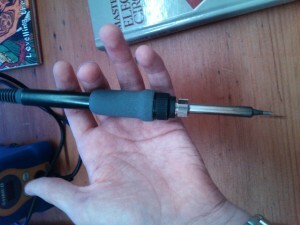 And the tip it is supplied with is a conical tip, which in my opinion isn’t the greatest tip type in the world. I bought myself a small chisel tip along with the iron which greatly improves the functionality of the iron as a whole. 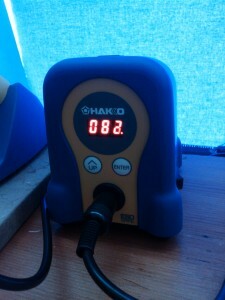 If you are looking for a sub-£100 soldering station, I would highly recommend the Hakko fx-888D! It only seems to be sub £100 without vat and postage from official dealer in uk.